mylittlevespa: Is this desk taken? I'n lying under my desk right now. It's not an ordinary relaxation technique, nothing which you'll be reading about either. I've started suffering bad migraines, this is somehow my own prescribed cure. And there are reasons, lots to be precise why I'm starting to get them, but none of which you'll care about. Nope, these are just horrible migraines, I now feel for those who suffer them. One of the reasons that I think has caused it is Christmas. To be more precise, the Christmas travel that I will endure in fifteen days time. Most people will try and relax at Christmas, many won't be able to. Christmas is stressful, let's not kid ourselves. Ever since I was young enough to remember, mine have consisted of being passed pillar to post in airports and suffering the indignity of having a suitcase that is overweight (thank you Heinz Baked Beans and Cadbury's Dairy Milk). There are no direct flights to Naples from the north of England in the winter, I've always changed at Brussels, Gatwick or Munich, on expensive operators and spending hours in an airport, waiting. But as time has passed, slowly and surely I started travelling by myself, finding the easiest option to get into Italy and then finding a way to Naples. Plane, train or auto mobile. Think Top Gear, only no racing. This year is no different. Manchester - Rome Fiumicino. Fiumicino to Termini. Termini to Naples. Naples to Roccarainola. I will see the odd recognisable character that over the years I have got to know. Franco, a train conductor is usually sitting at the same bar, every year, sipping on his morning macchiato. Nice chap. For all the love I have for England as a nation though, my stress starts here. In all my years of travelling, (think well over 500 flights) I've never known a nation like it. I've never seen another nation queue so flawlessly. Upon seeing someone from the airline lift a phone, perhaps to do an internal call, a queue begins, the plane hasn't been called, but a queue forms. And as time passes it gets bigger and bigger. It can be up to 40 minutes before anyone actually starts boarding the plane, but that doesn't matter. To the Brit, they are in the queue... F&*K YOU if you aren't! And you will hear the tut's and the "excuse me there's a queue here" when someone with speedy boarding dares to go to the front, after being so politely called upon. It's an unnecessary stress, the holiday doesn't begin there. The holiday doesn't end there. But to some, many, it feels that way. And Rome isn't any better. The bus driver who takes you to the terminal because, you're incompetent of walking 50 meters yourself, is actually having a coffee. The train which takes you to Rome central is never monitored, but you NEED a ticket, only there are no ticket machines. In all of this madness though, you are presented with the highest class of European engineering. 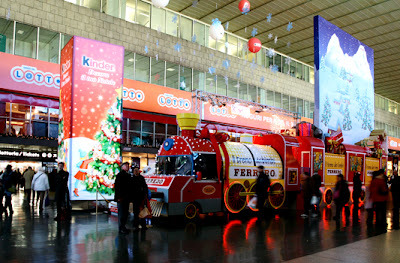 A train which dares go faster than the Japanese counterpart, it sits pretty, surrounded by travellers sipping on espresso, reading La Repubblica or Corriere Della Sera to boot. This is Italy, everything has to look at least, good. This year I bought my ticket in advance. €9 for quiet business class. A journey which takes 50 minutes, the distance of Manchester to London, and yet the only thing I can hope for is there to be a desk; after all the kerfuffle, I'll need one to lie under. 0 comments → Is this desk taken?